My personal operatic journey started 20+ years ago with a visit to Warsaw Chamber Opera. A tiny venue, a classical building hidden behind communist era apartment blocs did not promise much but turned out to be a life-changing experience. It was the first time that I listened to an opera at really close quarters – almost at an arm’s length – and the effect was profound. It was totally immersive and with the period costumes, the charming set and perfect attention to detail it transported me to the 18th century. Grey reality of Warsaw disappeared, I was transported to a different time and space – pure magic! The decision to start my voice studies was greatly influenced by that powerful evening. The company was the creation of one man – musicologist and oboe player Stefan Sutkowski, who in 1961 in the midst of Communist times traveled to Austria and in an antique bookstore bought a copy of the orchestra score for “La Serva Padrona”. He came back and put together a production which gave birth to the only private theatre in the Communist block. Over the next 50 years his tiny company staged all of Mozart’s operas which were played annually at the Warsaw Mozart Festival; held Rossini, Handel and Monteverdi festivals; discovered and revived ancient and forgotten Polish music; commissioned contemporary operas; and had a marionette stage as well. It is impossible to list all the good things this institution achieved on a shoestring budget. It relied, in its best years, on a combination of city funding and private sponsors. The Mozart Festival in June and July was a real treat in the city where traditionally most theaters close for the summer. It had two orchestras – an ancient music ensemble playing baroque music on old instruments, and the Sinfonietta playing everything else. Both the orchestras and the singers performed also at outside venues and events. Because of the small size home venue (160 seats), few international tours, and the low profile that director Sutkowski favored, the Warsaw Chamber Opera was in many ways Poland’s secret gem. It did not have the fame of Salzburg or the big names on its billboards, but it had high musical and artistic standards. It was a perfect training ground for young singers and a home for renowned singers like Olga Pasichnyk. Many people got hooked after just one visit, as I did, and ended up going to every new show and revisiting the old ones as they were revived. If it ain’t broke, don’t fix it. The Chamber Opera functioned well under two different regimes and for decades until someone decided that it had it too good. Four years ago city authorities carried out an audit of WCO and decided the whole thing was “wasteful” and even accused Sutkowski of “criminal” corruption. Storage of old sets and costumes, singers and conductors on payroll, too many musicians… City funding for WCO was cut by twenty five percent, forcing layoffs and closure of WCO’s many activities. It could no longer afford new productions. Director Sutkowski was forced to retire. The new director tried to expand the audience by doing open air events and addressing the financial restraints any way he could; but it was not enough. The Warsaw county regional government decided it could no longer afford WCP with its extravagant musicians’ pay of $459 per month. And so, this month it is disbanding the main orchestra, giving notices to all the conductors and the singers. To give a fuller context to this catastrophe, it is worth pointing out that public funding for art institutions is a tradition of many Eastern European countries. The whole region emerged from World War 2 and Communism with its old elites decimated and impoverished. Unfortunately, the new business elites are not much interested in supporting the arts. Poland is a place where music culture is high-quality but is not widely distributed through the country – unlike Germany, for example, where every town, even a small one, seems to support their own symphony or performance venue. In Poland many professional musicians, trained over 18 years in specialized schools, cannot find employment in Poland and end up emigrating to Western Europe. The Warsaw Chamber Opera was one of the last institutions in Warsaw that offered steady, albeit very basic employment to musicians, singers and instrumentalists. In the past four years WCO was receiving a city grant comparable to the budget of a repertory theatre – which usually does not have a live orchestra, a puppet theatre, a community outreach program and the ability to conduct scholarly research. It was 1/5 of the budget of the National Opera. After the cuts in 2012, the opera’s finances never recovered. So now the only “solution” is to let go of the people, and make project-style productions with contract musicians. Will the musicians still be available? If there are no jobs for them in Poland’s capital city many might leave Poland or even leave the profession. Will it be any more efficient? It seems that with 150 musicians laid off this ensemble will be gone. The new acting director who set it all in motion with the support of the regional officials thinks she “will make WCP great again”. Well, great it already was. Ironically, the acting director Alicja Węgorzewska-Whiskerd is a singer herself. It is painful to see how shortsightedness and private interests disguised as “sound management” can lead to the destruction of a beautiful institution over half a century old. This is not just a Polish problem. War on the Arts also seems to be the theme of threatened administration policies here in America, where the National Endowment of the Arts may be eliminated. What is there to do? Can art fight back? Will we be saved by protests, petitions? I don’t see good prospects on the long run. For Warsaw Chamber Opera – I hope people who were touched by the magic of this place will always remember it and find enough strength to carry on its legacy. Updated (June 3rd 2017): Stefan Sutkowski died on April 22nd 2017, the day his musicians were handed notices. Orchestras from all over Poland, including the renowned Warsaw Philharmonic are joining forces to protest the situation in solidarity with the Warsaw Sinfornietta. Who will play at this year’s Mozart Festival? Stay tuned. 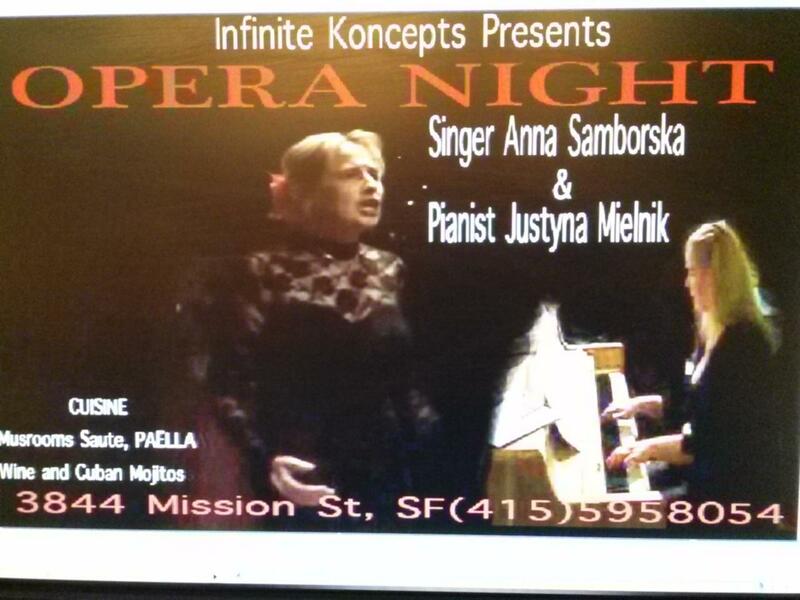 Recent performance at my daughter’s school – San Francisco teenagers love Polish opera! Last week Bernal Opera sang in Mendocino County, this weekend we will be performing – and entertaining – closer to home, at the Infinite Koncepts Gallery, 3844 Mission St, San Francisco. Program includes arias by Catalani, Puccini, Massenet, Boito and art songs by Karłowicz, Różycki, Dell’Acqua. Starting at 8 PM, Nov. 22nd, 20 bucks a ticket with some delicious food and wine included. If interested, call Alejandro at 415 595 8054 – see you there! I think we had a full house on Saturday – opera singing for many lovely, interesting people plus wine, snacks and cake. Of all the pieces performed the most commented one was my beloved “Aria with Chimes” from The Haunted Manor by Moniuszko. If I can get Rob from England to orchestrate more material my dream of staging this wonderful opera in San Francisco will come true! Apart from that, the recipe for a good evening is: two Verdis, three Puccinis, Handel, Rameau, Mozart and Wagner. Oh, and yes, Spohr. Kudos to Justyna for joining in and sight reading some of it on the fly. As a true Pole I am not able to say at this point what the rest of the season will look like, things will happen as they happen. If I can get Our Producer to open the house on a regular basis, let’s say once a month, we will plan the program in a more detailed way so that pieces don’t get repeated. I liked that some guests found out about the concert an hour in advance, confirmed, came in and had a good time. That’s pretty much how I go to shows – sometime during the day I realize I have a free evening, look around, see something on and try for it. I am also considering creating a separate Bay Area Classical House Concert Meetup group for promoting our events. It seems daunting to starts something like that from scratch, since through the established groups it is easy to reach many people at once. On the other hand it would put out a clearer idea what kind of music to expect. So watch out for it! Thanks to those who attended and see you again! I went to Scrap – a kind of organized junk yard for artists – and found a treasure. Anna Russell’s LP from 1951! Played fine on our turntable. It was so special playing vinyl – almost like having a living thing in the house. In her hoity-toity voice Russell gives “advice for song selections for concert singers” and she is pretty much spot on. If you don’t have pitch, sing contemporary music, no one will notice! If you have bottom and top, but no middle, go for operetta. If can’t sing high notes go for lieder. If things still don’t work out choose “the clear white or Nymphs and Shepherds” style (British). Superb parody of a beginner’s voice down to the little nervous trembling. Bottom line – anyone can sing a concert! 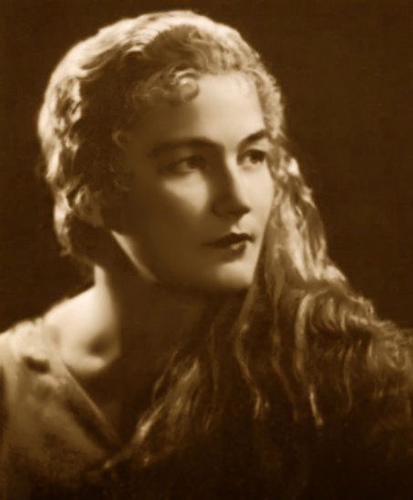 The pieces she performed in the show she composed herself. A truly talented and creative lady! Same with bel canto singing (except it is not silent) (and not necessarily seated).